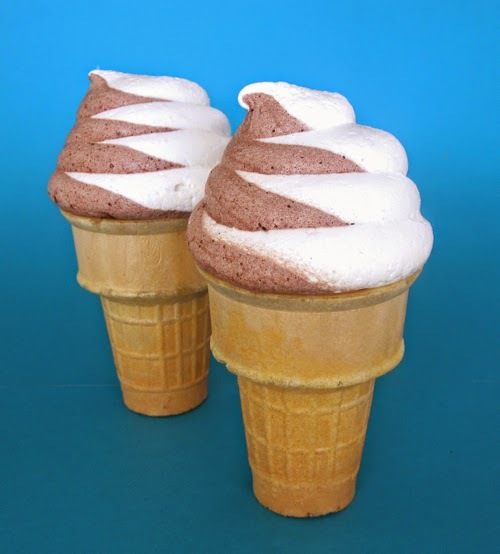 How great are these melt-free soft serve cones!? 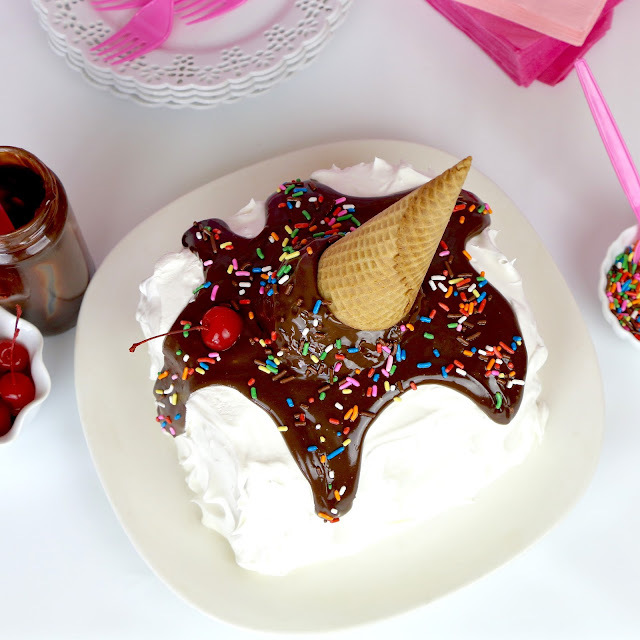 This might just be my favorite post from my collection of ice cream themed treats published all week for National Ice Cream Day. 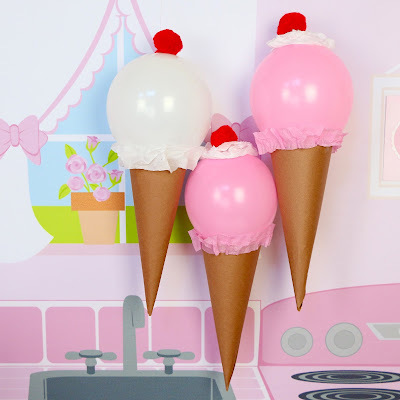 The trick to getting these cones not to melt is that they are not made out of ice cream at all! 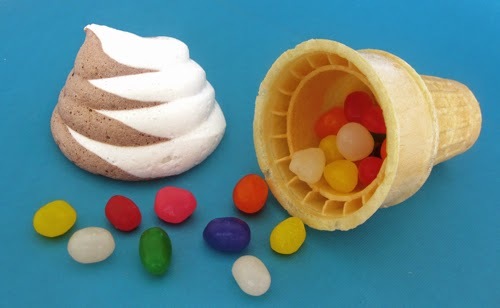 These mile high swirls of chocolate/vanilla soft serve are actually meringue cookies, piped to look just like real soft serve ice cream! I got the idea on my birthday a few weeks ago, when I treated myself to some frozen yogurt. So, I basically ended up drinking half of my soft serve because it was so hot out... leading me to my mission to create a melt free soft serve... and voila, faux soft serve ice cream cones made from meringue cookies (a low calorie, airy, melt in your mouth cookie, made of egg whites and sugar). The meringues take a while to dry, preferably overnight, so you can make the meringues the night before, and assemble when ready to serve. Separate eggs when cold, right out of the fridge, and let whites sit for about 30 min. to bring them to room temperature so they can puff up as much as possible. Make sure there is NO egg yolk in your egg whites and no grease or water on your beaters or in the bowl, none at all, or your egg whites will not whip up properly. Here is my video: How To Separate Egg Yolks From Egg Whites (4 ways) to help you out. 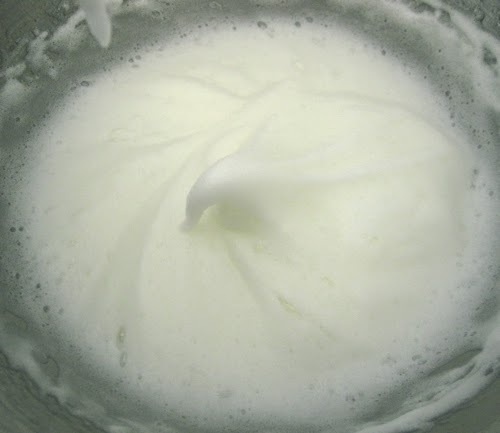 Using the whisk attachment of your electric mixer (or with a hand mixer), beat room temperature egg whites on medium speed until frothy. 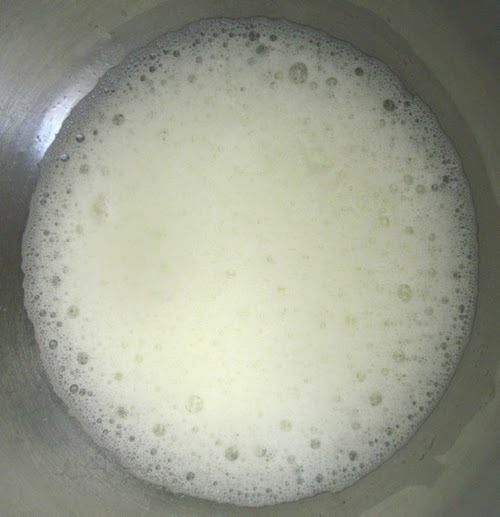 Add the cream of tartar and vanilla and beat egg whites until they hold soft peaks. (when you lift the whisk, the tips will fall over). 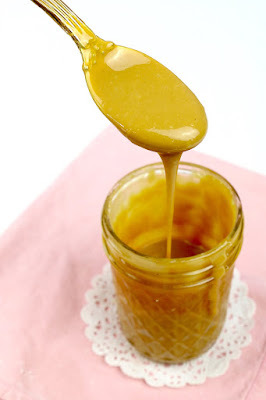 Very gradually add the sugar 1 tablespoon at a time and then increase the speed to medium-high and beat for about 7 minutes, until the meringue holds glossy, stiff peaks, and sugar has fully dissolved. 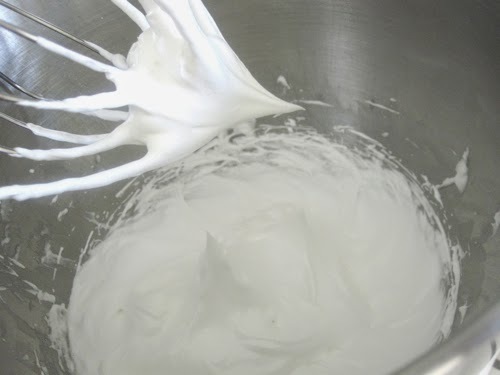 You will know the meringue is ready when you lift the whisk and the tips stick straight up without drooping and when you rub meringue between your fingers it feels smooth and not gritty. 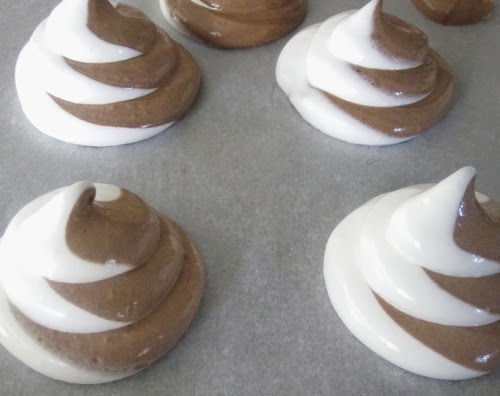 Place half of the meringue in a piping bag. Add cocoa powder to remaining half, and fold into meringue. Transfer into a separate piping bag. 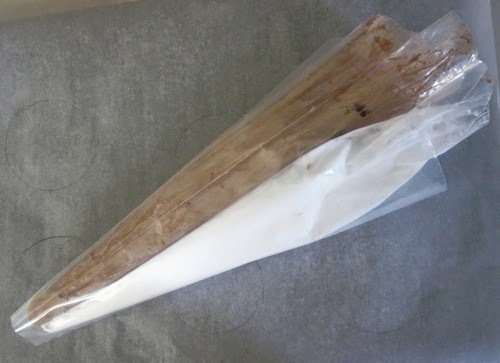 Snip off the tip of the 2 bags, and place side by side in a third piping bag. Snip about 2" off the tip off of the third bag. Pipe up tall swirls of meringue on the parchment paper lined baking sheet, using the circles as your guide. 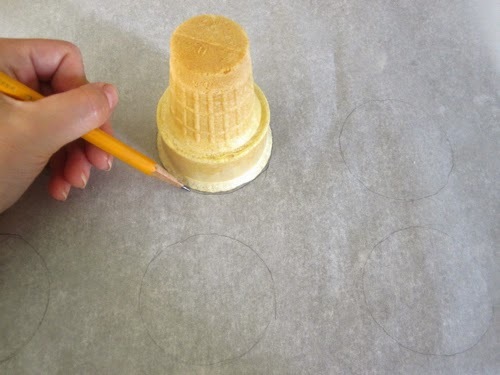 Make sure you pipe the base of the meringues inside of your circle template, so they are not too wide, and rest on the top of the cone nicely when they expand during baking. 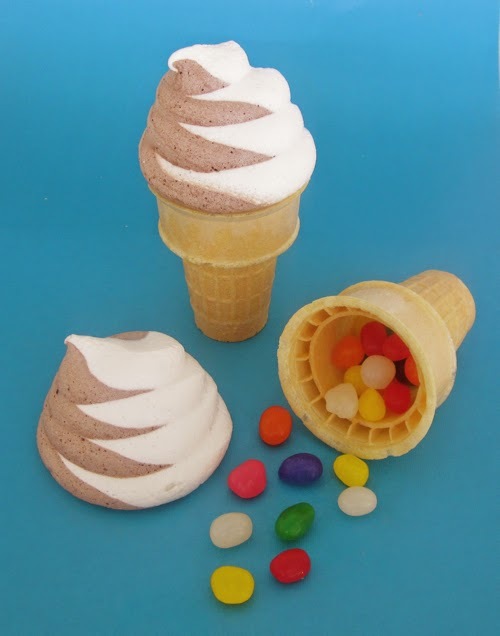 To assemble, fill cones with candy or treats and place meringue cookies on top. 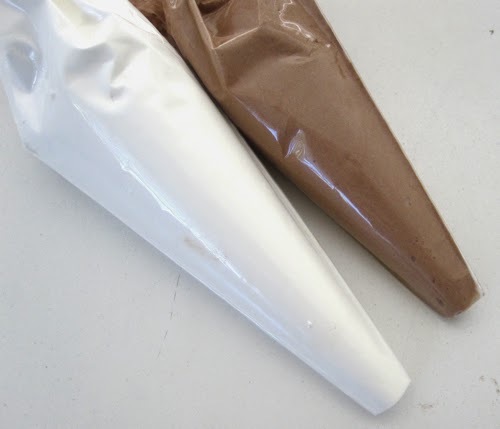 If you want the meringue to stick to the cone, you can use melted white chocolate as a "glue" by dipping the top of the cone in chocolate and pressing meringues on top; let dry. The are great as a party favor, too!